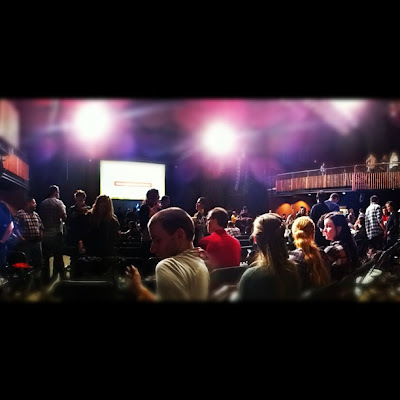 Verge is a Missional Community Conference hosted by the Verge Network in Austin, TX. 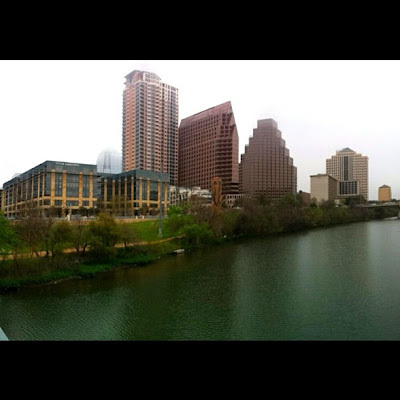 This year, it was located in the heart of Austin at the Austin Music Hall. Verge 2010 was a watershed moment of momentum in my life. God was shaking me up and reinvigorating my faith at the same time. My lasting impression from Verge 2010 was the idea of missional-- the sending outward of my faith within a local context (I.e. live as a missionary in everyday life). However, there was one constant pothole in this new road for me... it was another thing I did, not yet who I was. Meaning, I was focused on the do and not the be. Often, I would go serve my neighbors and then come home to my retreat to rest before re-engaging. Not bad, but not quite the heart of it-- I was on a good path just misdirected. All this began to change later in 2010 when after 7 months of this new rhythm, I attended an online conference in September called, The Nines. Jesus used Skye Jethani to rock me. His 9 minute talk about "Doing life with God and not just for God" righted this misdirection on my part. Thank God for his provocative reality check! I was always doing things for God's Kingdom and for the Gospel but I hadn't quite grasped that God wanted to do all these things with me, to do this life with me. God is interested in co-creating with us. Let that sink in. My lasting impression from Verge 2012 was incarnational living-- the tangible, life-on-life, this-is-really-messy living-out the Gospel everyday as a relatable example of Jesus' love. Also, business is Spiritual work and pray... always and first! Verge 2012 really solidified this for me. It wasn't as monumental of a conference for me this go around but more of an affirmation and confirmation of what God had already been breathing into me. It was encouraging, not earth shattering. Business is an outstanding Christian calling. We need to affirm the business people & commission them; talk to them about creating value & developing people in their business. Set big goals. They're risky. Right now, there is a global urbanization as people move into cities. 80% of the US live in urban cities; 50% worldwide. Every gift and talent is a spiritual gift under the Lordship of Christ. Work is indeed significant and spiritual. Business can be transformative. Understand those you serve and let them lead you on where and how to go. We must enter into their suffering with the same intimacy that Jesus stepped into intimacy with us. Justice is a stewardship issue. Move closer to those who are suffering. We need to plant churches in these places. People need more than our used clothes, they need our presence. The church is supposed to be the family of God in the neighborhood-- Christ's body in the community. Prayer is not God doing it for us but preparing us to do it. You have to seek after God. Mission shapes the way were are in our context, not what we do. If God is a missionary God then we must be a missionary people. If God is an incarnational God then we must be an incarnational people. Incarnational people are obsessed with people. Rarely will you feel the agony of what's going on [in people's lives] with theology, a brand, or a project. What is a missionary? Someone who sacrifices everything except the Gospel for the sake of the Gospel. Guide with your lives, not with your lips. We must live a better story and let others watch. If missional is go, then incarnational is stay. Stay and make your city a family. Start staying where God sends you. You know you're on mission when it gets messy. The Gospel is so powerful that you can live among the mess and still be set apart. We need to be making disciples of Jesus; leading people to ongoing surrender and dependency on Christ. Proclaim the Gospel into all of life. To Jesus, mission is what happens when we are in the pursuit of God in prayer. To us, prayer is what happens when we are in pursuit of mission. People just really want to see something that's real. Most people don't relate to our strengths. When you woke up today, did you get pumped that you'd encounter Jesus? Who are you depending on? If you depend on the Holy Spirit, He'll give you the action steps. We all look great from afar... but that doesn't disciple. Will we let people imitate our lives? We're not perfect examples, you and I, but we can be living ones. Remember Jesus Christ, raised from the dead, descended from David. This is my gospel, (2 Timothy 2:8, NIV). Paul has made the Gospel very personal. If the Gospel isn't good news to you then it isn't good for anyone else. Is it your Gospel? Have you personalized it (i.e. made it personal)?